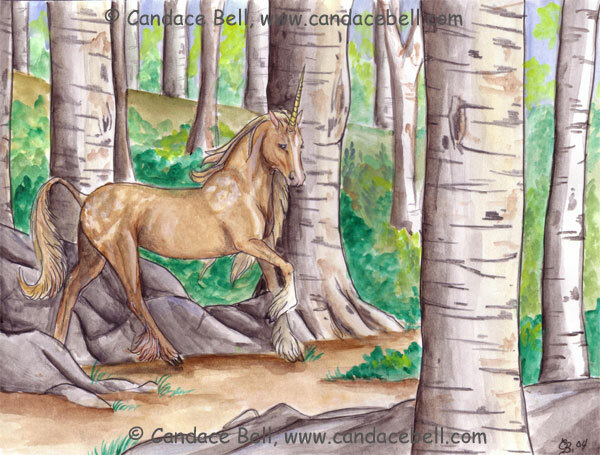 Title: Appaloosa Unicorn\r\n\r\n9"x12" colored pencil, watercolor and black ink on bristol.\r\n\r\nThis is a fantasy painting of a palomino/appaloosa unicorn walking through a lush birch forest.\r\n\r\n© Candace Bell, Pictures are not to be used in any way without express permission from me the artist. Title: Misunderstood\r\n\r\nI decided to call it "misunderstood" because as you can see its a very unusual couple from different statures of importance.\r\n\r\nI was kind of inspired by myself and all those other unique couples out there. 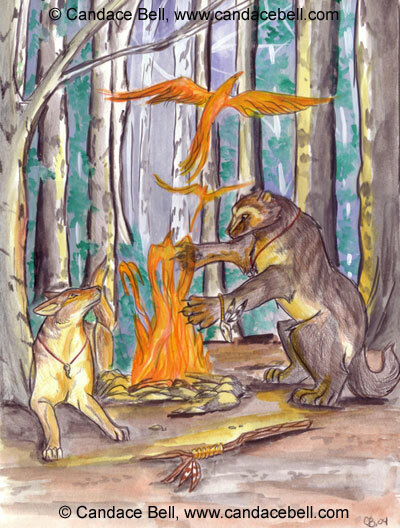 this is 9"x12" colored pencil and watercolor on bristol.\r\n\r\n© Candace Bell, Pictures are not to be used in any way without express permission from me the artist. 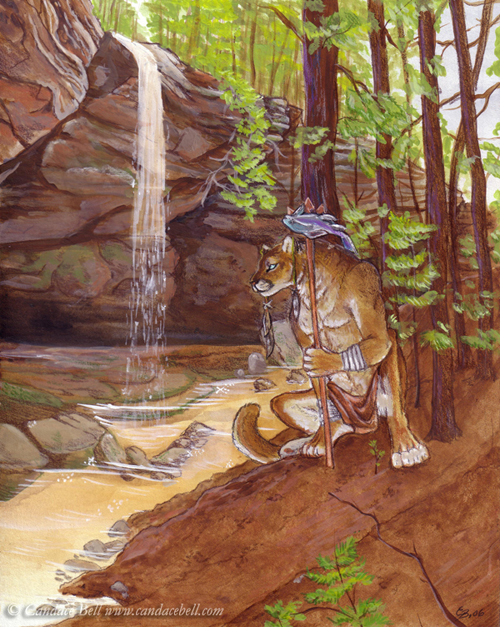 Title: Intimacy\r\n\r\nThis is a 9x12 inch colored pencil, watercolor and marker illustration on Bristol.\r\n\r\nIn this picture I wanted to try something a little more mature in the anthromorphic theme, hence the womanly features on the Lynx. 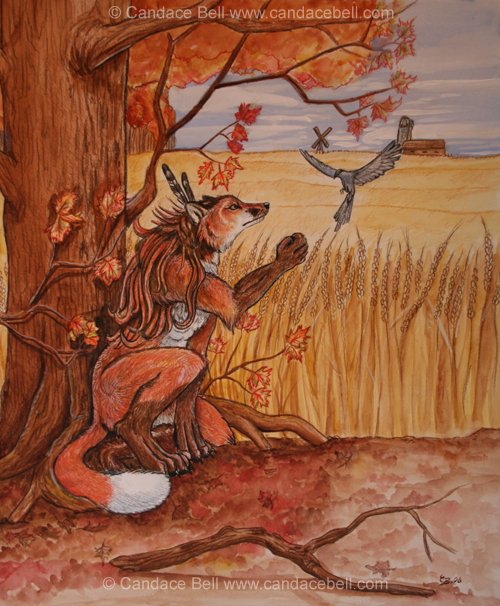 Here a male fox and female lynx share an intimate moment under the fall colors of birch trees. 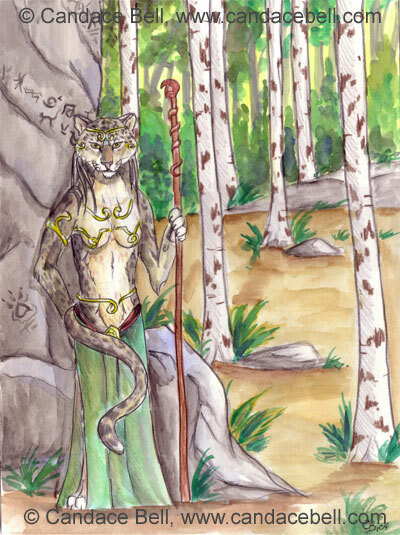 Title: Tree Stalker\r\n\r\nThis is an illustration of a tiger sitting high in a tree looking out over the landscape. 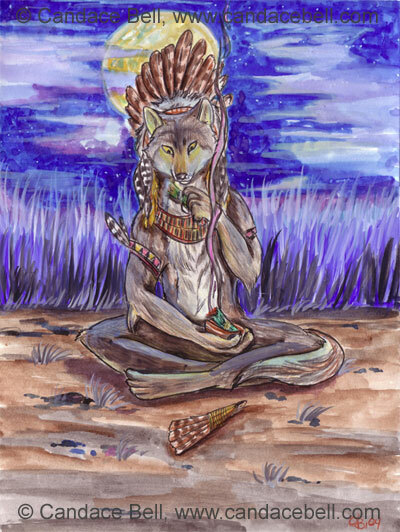 He appears to be a hunter or ranger of sorts.\r\n\r\n9"x12" colored pencil, watercolor and ink on bristol\r\n\r\n© Candace Bell, Pictures are not to be used in any way without express permission from me the artist. 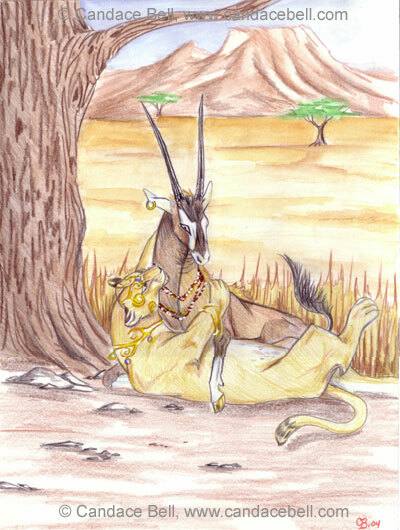 Title: Meeting on the grassy expanse.\r\n\r\n8"x10" colored pencil and watercolor on bristol. First peice of artwork done in these two mediums..\r\n\r\n© Candace Bell, Pictures are not to be used in any way without express permission from me the artist. Title: Bird Whisperer\r\n\r\nColored pencil, watercolor and acrylic on illustration board 18x15 inches.\r\n\r\n© Candace Bell, Pictures are not to be used in any way without express permission from me the artist. This is an oil on canvas panel painting 20x24 inches. 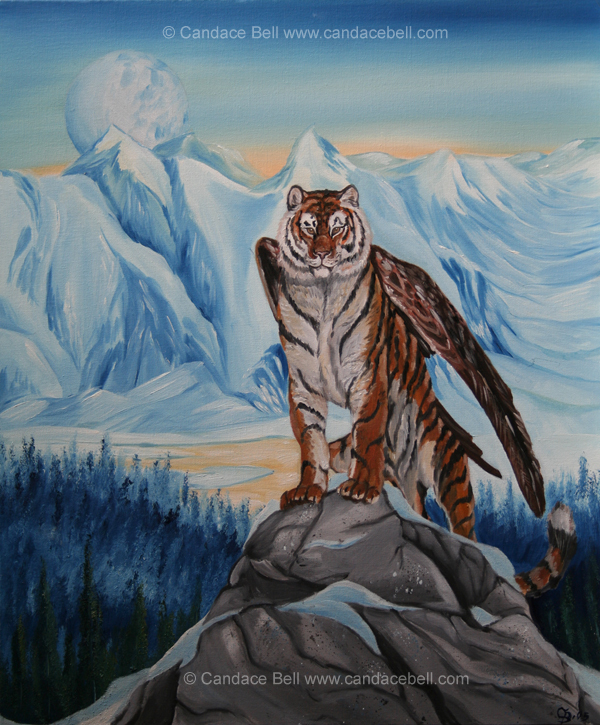 A winged tiger standing atop a rock formation against a wintry landscape. 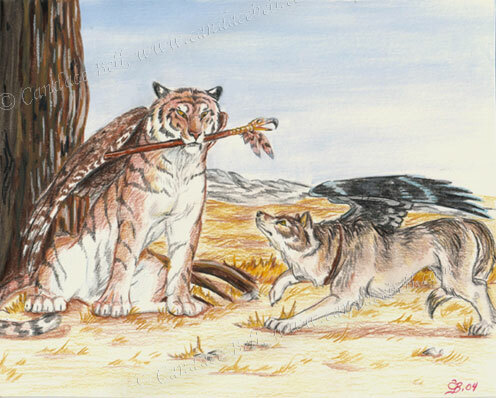 This is one I did a long time ago but only got the high enough quality images. Thanks for looking! 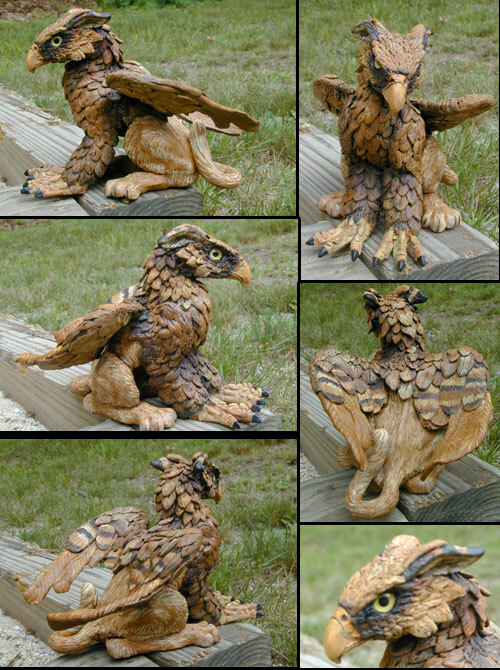 medium: acrylic on molded clay\r\nsize: 6x7 inches\r\n\r\nThis is an original, hand molded and hand painted sculpture of a griffon. It's unusual colors and glass yellow bird eyes makes him quite striking. This sculpture was created with wire and tinfoil support as the understructure and is molded with sculpey clay and painted in acrylic paint. The amount of detail is exceptional; each feather was layered on and detailed individually.\r\n\r\nI will soon have a commission page on my website to order a cutom made sculpture, if you are interested please contact me for inquires.\r\n\r\n© Candace Bell, Pictures are not to be used in any way without express permission from me the artist. My first /real/ digital painting! or drawing.. whatever its classified under heh. Anyway.. this is a character I made up named Kyran! 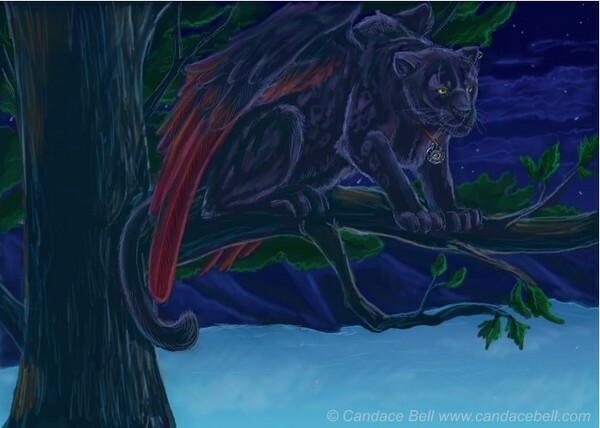 It started as a black leopard in a tree, but of course I couldnt resist adding some wings! and I decided to toss on a cool looking pendant and a bit of a small earing. I created this picture using my new wacom tablet and the Gimp!\r\n\r\nAvailable for commissions of this kind! My husband came out with the idea for this subject and I thought it would be fun to create. 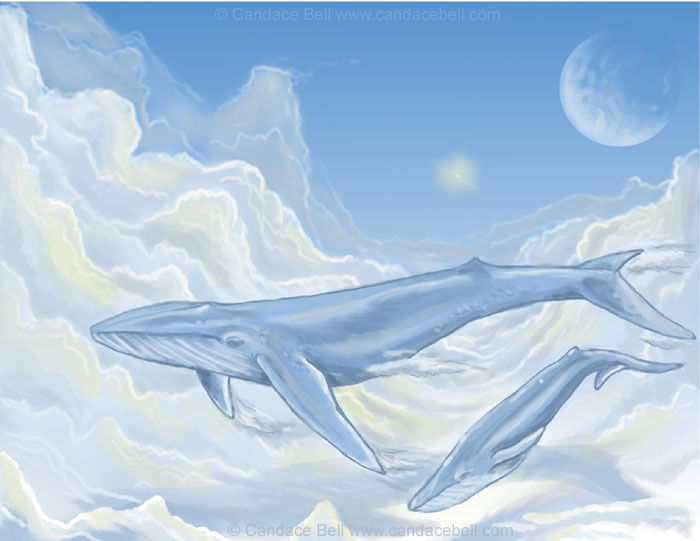 A blue whale and its calf swiming through the clouds. Digital painting.